Do you ever visit museums and feel that you lack the specialist knowledge, skills and experience to critically analyse and evaluate ethnographic objects and displays? This training course, run by the UCL Centre for Museums, Heritage and Material Culture Studies, is designed to provide the skills necessary to do this. Utilising collections at UCL, and with access to the British Museum and the Horniman Museum, this training course sets out to develop the skills and understanding necessary to best utilise ethnographic collections from Africa, the Americas and Oceania. 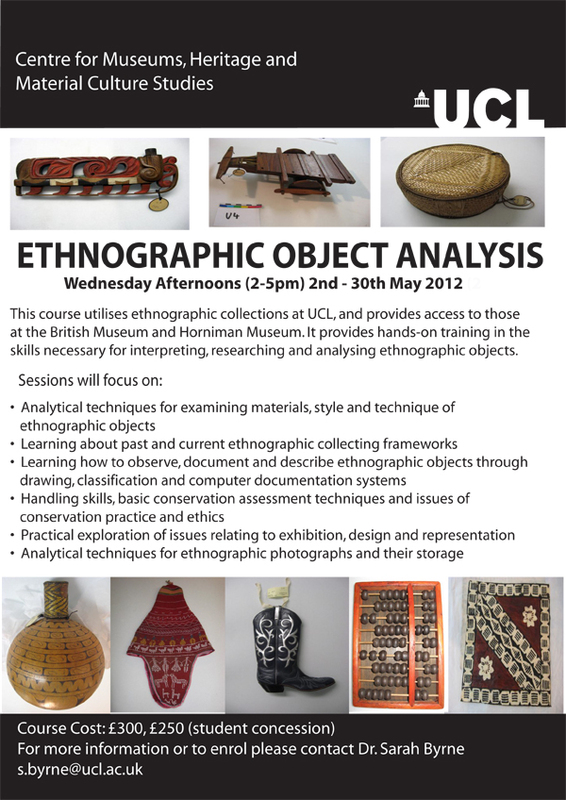 The course will be particularly suitable for those wishing to develop their ethnographic expertise in such fields as museum studies and cultural heritage as well as graduates keen to familiarise themselves with the materiality of ethnographic objects, images and collections. You will be guided towards relevant themes and perspectives through a series of hands-on practical sessions run on a weekly basis. The training course will provide participants with a practical grounding to become confident in handling and using ethnographic objects in research and creative media. It will also provide some of the necessary skills needed by those interested in pursuing a career in museums and galleries, anthropology, culture and heritage, art history and the education sector. 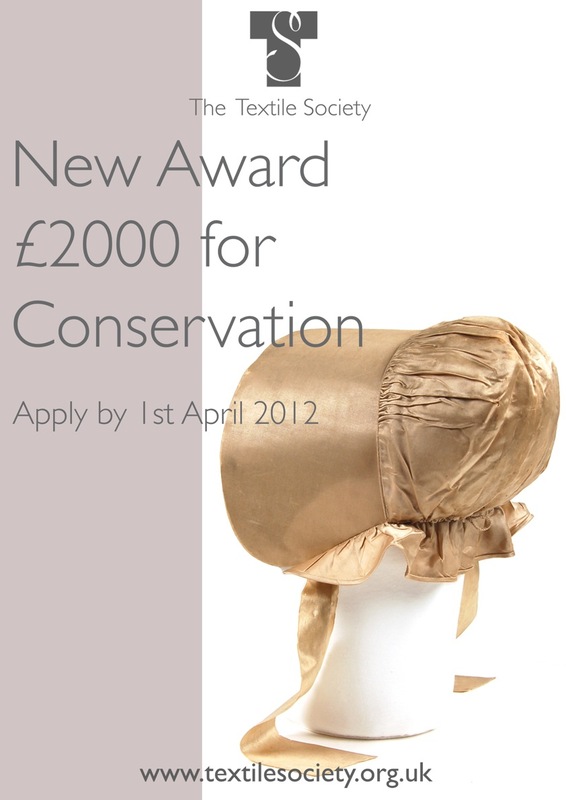 We invite applications for an AHRC-funded place on the full-time postgraduate Museum and Gallery Studies course starting in September 2012. Professional Preparation Master’s awards provide funding for Master’s or Postgraduate Diploma courses that focus on developing high level skills and competencies for professional practice in a field relevant to the content of the course. 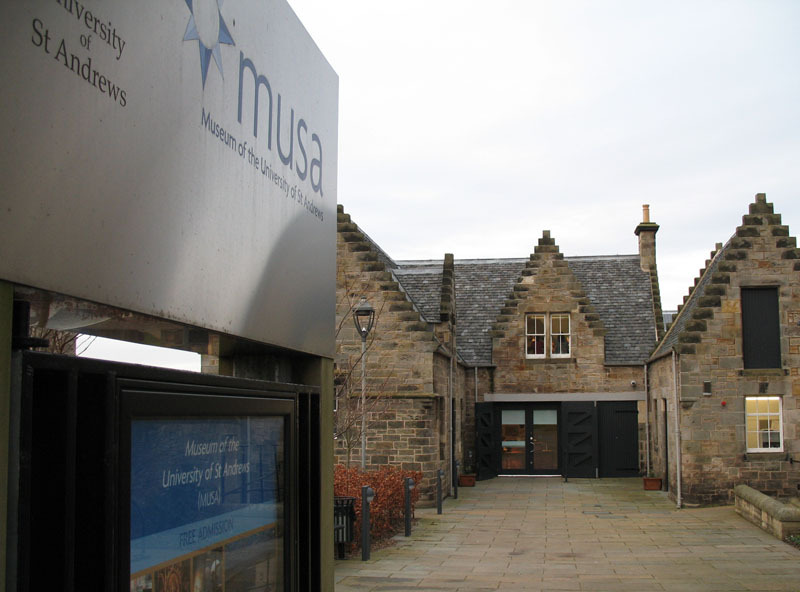 St Andrews is Scotland’s only centre for Museum and Gallery Studies and enjoys an international reputation for its teaching and research. The course offers a wide-ranging professional training, and a high percentage of graduates have gone straight into careers in museums, art galleries, historic houses and other heritage organisations. Modules on the Theory and Practice of Museums are complemented by practical activities, undertaken in local and regional museums. The teaching takes place in the University’s museum (MUSA) which can be used as a ‘laboratory’ for experimentation in museum interpretation and education. The vocational relevance of the programme is strengthened by links with the University’s museum staff and with outside museum professionals who contribute to the teaching. 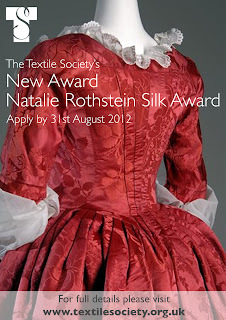 Although we are based in the School of Art History we welcome applications from all disciplines. We are looking for well-qualified candidates with at least a good 2:1 degree. * Complete a University of St Andrews on-line application form and, where the form asks how you intend to fund your studies, state that you want to be considered for an AHRC award. * Add a separate Supporting Statement document saying how the course will contribute to your long-term career development. This work is part of the EU funded Roma Routes project which promotes Roma heritage and culture, and involves heritage organisations and Roma representatives from Germany, Greece, Slovenia, Romania and the UK. Please also pass this on to others and do not hesitate to contact us if you have any information that might point us in the right direction.